Once, the coveted position of CEO - chief executive officer - was the unreachable pinnacle reserved for the lucky few born with a silver spoon in their mouths, that priveleged group that went to the right schools with the right people. But on today's level playing field, corporate chiefs get there on their merits. 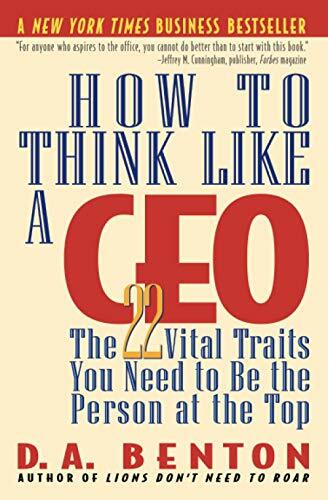 At last, you can understand the qualities that CEO's have - and how to make them your own as you make your own way to the top. Drawing on in-depth interviews, benton identifies 22 vital traits that make a CEO - the leader responsible for making decisions, guiding teams, selling ideas, managing crises and conquering the mountains before them. Penetrate the mystery of why some make it to the top - and some don't, even when they are equally good at their jobs. Learn how to avoid getting fired and how to get promoted more quickly, how to enjoy the life you deserve - and if you want to be the big boss, how to develop the character traits that will get you there.